I’ve sent a small collection of work to The Shop of Interest! The gallery is run by Martin Grubb, who is an artist himself, making beautiful prints and cards. He also stocks some firm favourites of mine, including woolydermist Lost in the Wood and David Fleck. The Shop of Interest is on Argyle Street in Glasgow. 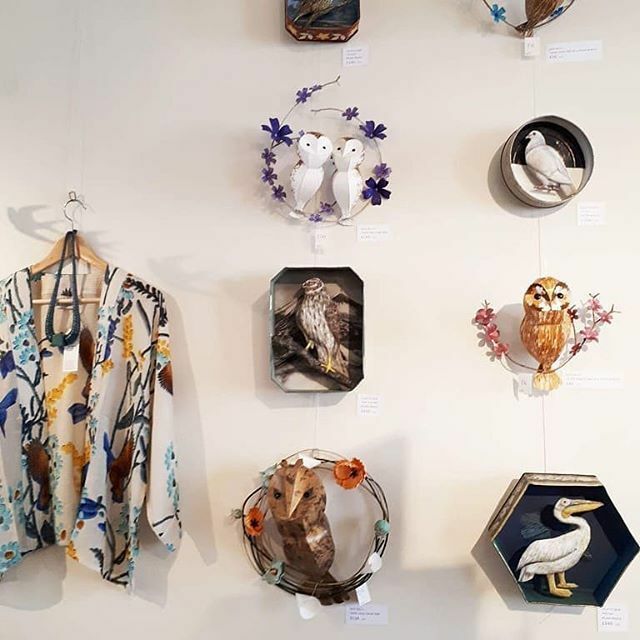 My paper sculptures are part of a lovely exhibition at Arteria, which brings together contemporary craft which is made with eco friendly concerns in mind. Upcycle Recycle runs until October 6th and has so much work from artists I admire. I recently sent this top up of work for the exhibition. Little Ovid in his orange floral wreath sold as soon has he arrived! What an honour. I do hope his new owners like him. My work has been displayed alongside Colette Bain and Jenny McCabe. Their work is so beautiful! The exhibition continues until 6th October. My paper sculptures are on holiday at The Bessemer II! Ecclesall Road is now home to a collection of parrots & baby owl sculptures. This is Agatha, the Yellow Tailed Black Cockatoo, and she has been sent to the gallery alongside some of her parrot pals and barn owl sculptures. It is such a lovely gallery, on Ecclesall Road in Crookes, just down the road from one of my favourite parks to go squirrel watching: Endcliffe Park. The gallery is home to a lovely collection of contemporary craft as well as selling delicious cakes and beverages in the cafe. Well worth a visit! Bessemer 2 is open Monday - Saturday 10 am - 6 pm and Sunday 11 am - 4 pm.